Find on our blog all the information, resources, discussion that can help you use EnglishCentral with your students or clients. Comment, like and spread the news of how we are serious about learning language through authentic media. We are the experts backed by YOU – the experts on the ground. For full information about using EnglishCentral academically – Go Here. Got a question? Got an idea? Need more info? Want a personal tour through our tools? Want to share your research? Want to connect in any way, shape or form? Contact us through support or at teachers@englishcentral.com We will reply ASAP. Yes I would love a personal tour through the tools. Although I explain English Central quite often to students here in the Netherlands, I know that there is always more to learn! Shall we make a skype appointment? I’ve been using English Central Videos with my students for a long time successfully without any problems. However, this month I’m always having problems with the reports: students do the task but it is not recorded at all. In the past it used to happen from time to time, but this week the report of 20 students out of 25 failed. I checked everything I did and they did and everything was correct. I’d be most gratefu if you could help us with this problem. I’m so fond of your excellent web I wouldn’t like my students to be discouraged! Thanks a lot in advance. We are here to help! Please, with any problems respond by email to with your registered email address and school/class name. Hard to say what is going on but please send us an email and our customer service team gives teachers top priority. Don’t worry, your student’s data is never lost, if there is a problem it is with that appearing in the reports. Also, did you make sure to select “Only Class Activity” to see just the results from the videos you selected? Thank you for your quick response. I’ll check what you say. Besides, this very morning I got an email from your technical support team to find out more about the problem. You’re so efficient! Thanks again. I am having difficulty deleting a couple students from a group they were in last semester. Could you please add labiodental fricatives /f/ and /v/ to your pronunciation list? Thanks! Trying to use the Listen function to hear my students, but all I get is the regular video coming up. It was OK last week. Is anything down at the moment? Please let me know when a good time is for you or / and your colleagues. Or use the Scheduler here – http://www.englishcentral.com/blog/contact-us/ We can skype and I can introduce you to some features and take your questions/feedback. How can I delete students from the previous semester? I have been taking a rest for the past three months and now trying to reuse it but fail to create my own courses. “Mangage” button doesn’t work. You can delete students in one of two ways. 1. Select the Class and Manage – Students . Select the students and then “delete student” then invite new students. 2. Select the Class and Manage – Students. Then “delete class” on the right. You will be asked to confirm. Next, make a new class with new curriculum and then invite new students. If your Manage button is not working, try refreshing the page. Sometimes there might be a problem connecting to the database. If it continues, please contact us at teachers@englishcentral.com and we’ll get it looked at! I am having trouble selecting topics. I choose topics, save them, and they don’t show up as selected. Hey dude! That happened to me too. But here’s what! Before they started the course thing i had selected the option to have the students choosng what content they wanted to see, so if you did that too just uncheck that option and you should be fine. And all the courses you added are gonna show up. I am having trouble with all the settings too. I have set courses, they disappear, I revise the goals they won’t change. This also makes it hard to track students progress! Please refresh your browser. This will 9 / 10 times resolve this problem or also all the database related problems of setting on EnglishCentral. If it persists, let us know at teachers@englishcentral:disqus .com with your account email address and we’ll look at it ASAP. Is it possible to edit a student’s email address? Some of my students made mistakes during the registration process. Thank for the prompt reply. I will try with my students tomorrow. I love the iOS app. It looks like English Central is moving toward the mobile world. When do you expect to link the mobile app to user accounts and provide feedback just like they were signed in on a computer. Again, love the layout and functionality of your new app and I am eagerly awaiting the ability to sign in and connect to mine and my students accounts on our iPads. Thanks for the positive feedback about the mobile app. Our mobile products are still “under the radar” and once we have a good, basic free product – we will be promoting more and expanding them. This goes for ipad/mac. We are moving slowly with a team and want to do it well. it isn’t simple and is basically a whole new product. Like mobile, we take quality seriously and want to have a great product in place and know it is worth taking the time to do it well. So nothing definite there yet but as you can see – we are making steps…..
How do I use EnglishCentral as an EFL teacher? I mean do I buy the Premium for 180 USD and then have to buy 1 seat at 180USD for each student/pupil??? This seems too high for me as a freelancer. Is there any bulk discount for signing up students? Thanks for your inquiry. We have big discounts for all teachers and academic users (we do understand that students / schools can’t afford the regular pricing and the larger numbers in education allow us to offer lower pricing). Are you registered as a teacher? 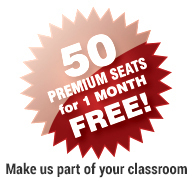 When you go to your TEACH tab, you’ll see a contact us form under Buy Seats there. I’ll reply shortly to you in detail by email with all details about discounted academic pricing. How do I find the script for the video? I know I saw this last weekend, but can’t find it now. You have to go to the video detail page for each video (the page where there is a large image and info. about the video.). Click on any thumbnail and you’ll land there. Then click “View Transcript” and a lightbox will popup where it is easy to copy and paste into your own document. If you are studying from a course, it is a bit tricker. You’ll have to search with the title of the video and find it that way. We’ll reply by email with our academic pricing. It is largely discounted from the individual pricing stated on the website. Semesters are 4 months. At the moment, I am unable to enter any dates beyond December 31st, 2012. Are you planning to add 2013 to the date ranges? I usually set my goals for one month, not one week, but I am unable to do that. This question is likely answered somewhere, but I can’t seem to find it. I am curious if there is a way to change the order of courses in curriculum? Course are automatically place in the order they are added with the most recent being at the top of the page- thus appearing first. Is there an easy way to change the order of the course in a class? For the moment, you are correct – you’ll have to delete the course from the curriculum/class page and then select them in the opposite order to which you want them to appear on the class page. We do have in our product roadmap an ordering feature (and also for class individual video lessons) but when we first designed this we had the use case in mind of there only being one course on a class page and teachers would make a new class or group in the class to offer a new course. Thanks for the reply. I understand. The ability to reorder course after the fact would be a nice feature. One more question, Is there a way to copy an existing class into a new class – thus not having to select curriculum content again for different sections of the same course or for a course taught multiple semesters? Unlike traditional LMSs where you create a whole new entity and then “copy” curriculum from a previous class – we urge teachers to just keep the same class and remove students who’ve finished and repopulate with new enrollment. A class becomes more of a “physical” place. However, we do see the need for copying curriculum and that too is in our roadmap but not developed yet. So you can make one class with curriculum and then copy for 5 or 6 others without the need to add for each class (however, at present, easier if you make all classes and then just add to the classes in one go from the video detail page dropdown when you click “Add To Class’ (and it is now in the upper right of a video page. Hope this is clear enough. Regards. I attended the Browne webinar a couple weeks ago and referred to a couple times in a training session last week. I wanted to revisit some of the content, but I am unable to find the archived webinar. I thought I remember David or Charles saying that the video or PPT would be available on the site. Could you point me in the right direction for this, please? Much appreciated. Cheers. Still trying to learn how to navigate the site here. Thanks for the direction. How long since your site stopped being free? Hi English-Central — I have tried to get a hold of your rep in Korea, but I got no response. Please contact me re classes this spring. Someone will contact you asap. We’ve forwarded the request directly. Don’t ever hesitate to also use our support page. Any communication there will be ticketed and immediately replied to and sent to the right person. Thanks! Hi, I’ve just watched this video http://es.englishcentral.com/video/15263/the-purpose-of-getting-good-grades-in-school before my students try englishcentral for the first time and fall in love with it. The translation of work: utero. context: work hard. Please can you tell me how a student returns to EC website once they have clicked on the link in their email. i.e the following day etc, do they need to keep clicking the link in the email? I ask because I have reasonably young students who are not permitted email accounts so their parents will allow me to register them under their names. This however could cause issues when the student wishes to log in and continue the course and the parent is not around to provide the link in their email account. Is it possible to enroll my students using my email address and then for the students to have a log on? thanks for your help. This is simple. Once the student has clicked the link in the email one time and registered/enrolled in the class – they simply have to look for the My Class button at the top of the website when logged in. This will show all the classes they are enrolled in. They just select that class and they are on the class page. Often, when they arrive at EC, they’ll also be taken right to the class page. But you also don’t have to use email. You can register them with an alias – studentname@myemail.com for example. And also a standard password for everyone (they can change later). You’ll have to share what the alias and password is with students. Then, enroll them through our LMS with an invite (they won’t get an email!). Then when they log in using that email address, they just click My Classes like above. But be sure to record the alias emails and which student has which – in case students forget their email address/password. Can I open a chat window for my students? Is it possible to select specific words that I want my students to study? The short answer is no yet, not directly. However there is a way. You could put the words on the class page as an announcement or hand them out as a list in class. Student can then 1. Search for the word / word form. 2. Favorite that word and add to Favorites in their My Words area (click the progress bar at the top of each page to go to the My Words page). 3. Students load up their favorites list and then press – Quiz. Students will then be studying those words in our quiz app. Also, students can click the video thumbnail for a word and get playlists with many examples of the word in use. I hope this helps a little! Of course, in the Learned Words report – you’ll see how many and which each student studied. I enrolled students in my class. I have academic seats available to assign to these students. The system will not let me assign the seats until they accounts are registered. I need to manually register them today so that I can assign the seats, as I am leaving the office and cannot wait for them to all check their emails and register whenever they want to. This is for a self-paced summer project. Replying here in addition to my personal email. Your students will be upgraded and get their paid seat once they complete the registration process. Rest assured. In addition, you can contact support http://www.englishcentral.com/support and they can double check for you and make sure they did get access in your absence.